Welcome to the 2014 Holiday Gift Guide Giveaway! Hosted by: Xtreme QponRude MommyGiveaway Goddess and Mom Buzz Media And a special thanks to our CoHosts: Joyful Gifts by Julie, Mommy Makes Time, Keystrokes by Kimberlyand Work Money Fun The holiday season is all about giving, although the recieving part is pretty fun too! These wonderful sponsors below want you to have the opportunity to win a holiday gift! Whether you decide to give it away or keep it for yourself is totally up to you, but you can't win if you don't enter!Prizes:NutriBullet System or BabyBullet System ($79-$110 value) Every Man Jack $50 Gift CardPlasma Car ($64 value) Ninja Turtles 3D Light FX ($42 value) PersJewel PinchMe Dough ($20 value) $25 Amazon Gift Card (Sponsored by the bloggers! )Read the product reviews here! Giveaway is open to US Residents only. Giveaway begins on 11/15 and will end at 11:59pm on 11/30!Good Luck to everyone that enters to win this cool giveaway! Kohl's runs its Black Friday deals from 6pm on Thanksgiving until 1pm on Black Friday. Deals are available on Kohl's website until 3pm CST on Black Friday. Kohl's Black Friday Deals50% off all toys32" Direct LED HDTV, $99.99 (reg. $199.99)Fitbit Flex Wireless Activity & Sleep Wristband, $74.99 plus $25 mail in rebate (reg. $99.99)Discovery Kids Digital Camera, $19.99 (reg. $69.99)The Black Series Video Game Boom Chair, $39.99 (reg. $99.99)Disney Frozen Fashion Jewelry, $8.99 (reg. $20)Monster High Dolls or Barbie Fashionista Dolls, $6.99KitchenAid Artisan Stand Mixer, $299.99 (after $50 mail in rebate) + Extra 10% OffKeurig Elite Coffee Brewer, $99.99 (reg. $149.99)Dyson floor care, 30% offPlus, get $15 Kohl's cash for every $50 spent Check out the full Kohl's Black Friday ad. Macy's is opening at 6pm on Thanksgiving. Black Friday sales run from 6pm Thursday to 1pm Friday, then again from 7am to 1pm on Saturday. Macy's Black Friday DealsRampage Boots, $19.99 (reg. $59/$69)Cuisinart 3-Speed Hand Mixer, Stick Blender, Bella 12-Speed Blender, 12" Skillet, Electric Griddle, Panini Maker or Fagor Casa Essentials 5-Quart Pressure Cooker, $9.99 (after $10 Rebate)Bella Rocket Blender, Rotating Waffler, Stainless Steel Toaster or Hot Air Popcorn Maker, $7.99 (after $12 Rebate)Rachel Ray 12-Piece Hard-Anodized Nonstick Cookware Set, $99.99 (reg. $229.99)Cuisinart Brew Central Thermal Coffee Maker, $59.99 (reg. $129.99)KitchenAid Architect 5-Quart Stand Mixer, $264.99 (after $50 Rebate)Holiday Lane Holiday Trim, 60% offTag Springfield 5-Piece Luggage Set, $49.99 (reg. $200)Dirt Devil Hand-Held Vacuum, $9.99 (reg. $29.99)The ad also has coupons for $10 off $25 and $20 off $50 Check out the full Macy's Black Friday ad. Good afternoon everyone, thank you for stopping by! :) I want to share again an awesome company called Stickman Stew that is really in the Spirit of Christmas this year!! I think its awesome what they are doing! They are giving toys to organizations that help children, I am very proud to be a part of this for this Christmas!! I have chosen a Children's hospital for toys to be donated too. I just can't even begin to imagine what the children and the parents are going through! Thoughts and prayers to all the strong kids fighting with sickness and the parents and family. If you want to order toys for some kiddos in your family and then Stickman Stew will donate check it out here. In theaters for TWO weeks only!!! Starts this Friday the 14th!! About the movie: This Christmas, have your family join with Kirk Cameron’s family and dive headfirst into all the joy, dancing, celebration, feasting, imagination, and traditions that glorify the true “reason for the season.” KIRK CAMERON’S SAVINGCHRISTMAS is an engaging story that provides a biblical basis for our time-honored traditions and celebrations, and the inspiration to stand strongly against a culture that wants to trivialize and eliminate the faith elements of this holy season. So take in the splendor; take in the majesty; take in the story. Take it all in… and let’s put Christ back in Christmas! KIRK CAMERON’S SAVINGCHRISTMAS is in theaters for a limited engagement beginning November 14 for two weeks only! SAVING CHRISTMAS is an engaging story that provides a biblical basis for our time-honored traditions and celebrations, and the inspiration to stand strongly against a culture that wants to trivialize and eliminate the faith elements of this holy season. So take in the splendor; take in the majesty; take in the story. Take it all in… and let’s put Christ back in Christmas! Click HERE to read a Review of "Saving Christmas". KIRK CAMERON’S “SAVING CHRISTMAS” is in theaters for a limited engagement beginning November 14 for two weeks only! To see if "Saving Christmas" is showing at a theater near you go to their Official website HERETo following along with Saving Christmas go to their official Facebook page: HEREYou can win A SIGNED Saving Christmas movie poster (by Kirk Cameron), the soundtrack to the film, and a car air freshener that smells like a Christmas tree! Good Luck! Office Depot and Office Max will be open from 6pm to 9pm on Thanksgiving. Doors open again at 8am on Black Friday and then 9am on Saturday. Office Depot & Office Max Thanksgiving Weekend DealsHD Android 9" Tablet w/ Keyboard & Case, $49.99 (save $70)Samsung Galaxy Tab 3 Lite Tablet, $89.99 (save $70)Dell Inspiron 15 Laptop Computer w/ Intel Inside Processor, $179.99 (save $120)Dell Inspiron 15 3000 Series Touchscreen Laptop Computer w/ AMD A6 Processor, $279.99 (save $250)2 XL by Skull Candy Offset Earbuds, $1.99Bluetooth Portable Speaker, $9.99Canon PowerShot ELPH 150 2.7" LCD Camera, $99.99 (save $50)Realspace Dawson Canyon Maple Computer Desk, $82.48 (save $97.51)Sharpie Permanent Marker (12-pk. ), $3 (save $12.99)15% off dining gift cards (Red Lobster, Panera Bread & more) Check out the full Office Depot and Office Max Black Friday ad. Dollar General has sales going on the entire Thanksgiving weekend. Some deals are available Thanksgiving only while others are available Thursday to Sunday. Dollar General will be open from 7am to 7pm on Thanksgiving. What a great giveaway!! Good luck to everyone that enters! Welcome to the La Siesta Hanging Crow's Nest Giveaway hosted by IHeart-Motherhood & Housewife on a Mission, and sponsored by La Siesta! The La Siesta Hanging Crow's Nest JOKI is made of high-quality cotton. It hangs easily from the ceiling like a cocoon & features a large, snugly pillow! This swing is perfect for dreaming, reading or swinging-- the gentle movement supports your children's sense of balance which positively impacts the ability to concentrate while reading or writing. Jessica at IHeart-Motherhood recently had the privilege of reviewing the JOKI with her son, you can read the full review here! So who would you like to win this amazing swing for? Feel free to stay connected with La Siesta on Facebook & Twitter! 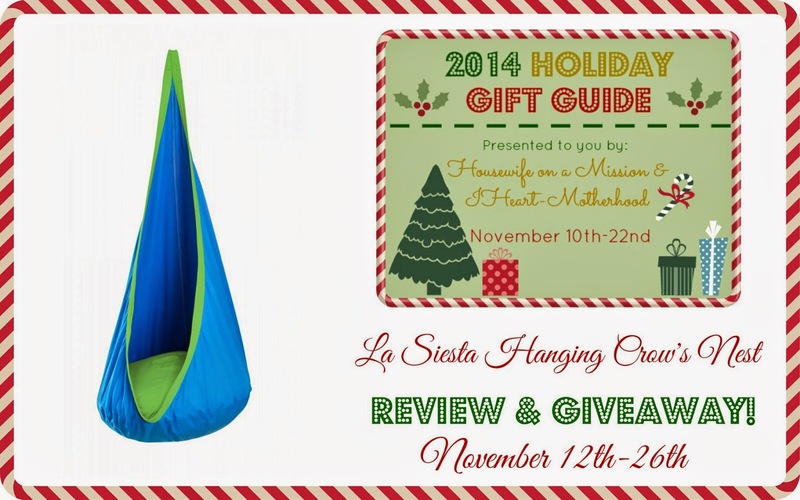 Buy it: You can purchase the La Siesta Hanging Crow's Nest JOKI online for $109 in 5 fun colors! Target stores are opening at 6pm on Thanksgiving. There are doorbusters that start then, but others that start later in the evening. Check out the Target Black Friday Ad. Welcome to the BrylaneHome Aurora 6 Shelf Bookcase giveaway, hosted by Housewife on a Mission & IHeart-Motherhood, and sponsored by BrylaneHome! Looking for a unique gift for the person in your life that is hard to shop for? We think the Aurora 6 Shelf Bookcase is perfect to gift! This beautiful open shelf style bookcase is a BrylaneHome exclusive, and is simply elegant. With its sophisticated look, this bookcase is perfect for displaying in your living room, bedroom or office. It has a dark walnut finish, 6 shelves and comes with an unbeatable price tag! What a great giveaway this is!! I would love one of these shelves in my living room or office. I'm sure a lot of us could always use more shelves for things, so what are you waiting for? Why not enter this cool giveaway for your chance to win a great bookcase. Wishing each of you the best of luck! Housewife on a Mission had the opportunity to review this bookcase. To read her full review, go here. This post brought to you by Rumble. The content and opinions expressed below are that of Lisa-Queen of Random. Hey there everyone, I don't know about you, but, for me I love cute things!! I loved my kids being so cute when they were babies and even a little older. Now that they are teens, I look to my cats for cute things! Lol. I watched the video with the cute kitten playing around! So cute! It was adorable, of course I'm a huge fan of sweet kittens/cats. The twins fighting over toys is also too cute! Do you have some cute videos that you would like to share? If so check this out, it's called Rumble and its a pretty cool site. The Kmart Thanksgiving/Black Friday ad is out. Stores are open from 6am to 5pm on Thanksgiving, then 7pm until 3am, and then open at 6am on Black Friday. Kmart Thanksgiving morning dealsProctor Silex 2-Slice Toaster (White), $4.99RCA 46" Class LED 1080p HDTV, $299.99 (reg. $449.99)iLive Bluetooth On-ear Headphones, $9.99 (pay $49.99, get $40 back in Shop Your Way points)Disney Frozen Snow Glow Elsa Doll, $29.99Classic Standard Microfiber Pillow, $1.99 There's also a coupon for 10% off apparel.